May 24 - Opening Day! We started our year with a visit from Becky Ellis of Earth Magic Permaculture, who advised us on how to sheet mulch our plot. 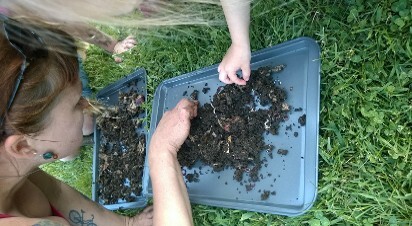 Becky brought along some Red Wriggler Worms and gave the kids a little demonstration on what worms can do for compost and also on the life cycle of worms, a key ingredient in building healthy soil. 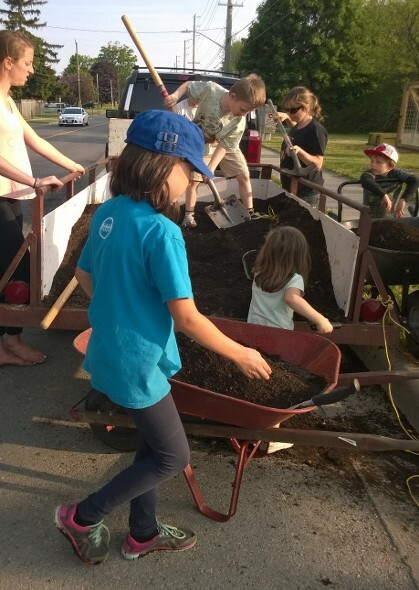 We continued working on our soil building project, implementing a mixture of mushroom compost, sheep manure, and topsoil purchased from Silverthorn Landscape Supplies. For those of you that are wondering what kind of things your donations go towards, it's purchases like these that give us the opportunity to talk to the kids about the importance of soil and improvements to Soil Organic Matter. We finished working up our soil in the front corner here, and we put in our tomato plants, which earthmama farms grew from organic heirloom seed purchased from the good folks at Hawthorn Farm. You can see the beautiful new deer fence that the city put in this year. 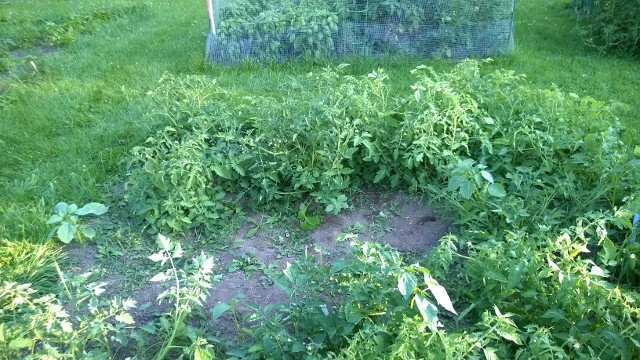 This same plot last year was where we grew our Three Sisters patch, and boy did we have deer problems! Thank you Mayor Jackson! We had the kids put in their green onion starts. It was a really great night because they are starting to come together as a team. They're getting to know each other a little better now that we've had a few classes and everyone is getting along. We also worked on drawing colourful pictures of the different types of vegetables that we have put in to help identify what's what. We also asked the kids for ideas of what they'd like to grow next, and the result was watermelons, unanimously. Neither Coach Amber nor Coach Heather have ever grown them before, but with such an enthusiastic response, we figure we'll give it a try! After a little internet research, and a trip to Briwood to pick up some seeds, we decided to put in some watermelon seeds. 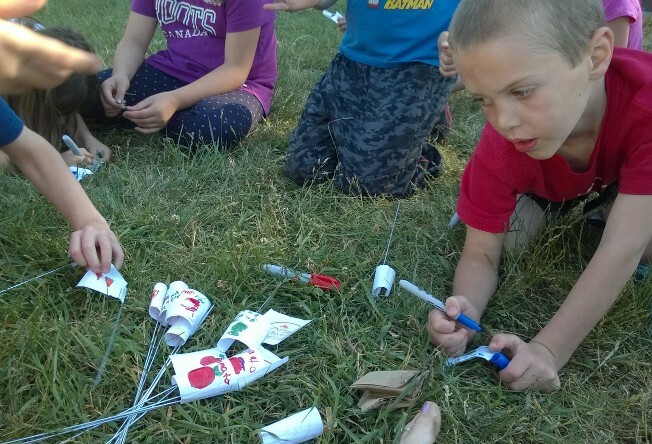 We had the kids pair up to form their hills, and after they had put their seeds in Coach Amber had them name their hills so that each one would know which seeds they planted. Wish us luck! We had a little time to wait in the beginning of class since most of the kids were here early, so we played a little game of Duck Duck Goose around the sunflower circle planted by the Community Garden Committee! Great job guys! We had a visit from St. Thomas Mayor Heather Jackson! Class began with Mayor Jackson joining us for circle time. She spoke about how when the city recieved the request to build the deer fence, all of the councilors approved it unanimously. She told us that the councillors said that "Hope Starts is running a really great program so we need to do something to help them out." She also spoke about her own garden and told us about the way she decided to get into politics. It was a really great talk followed by some really insightful questions from our Junior Gardeners. The Mayor agreed to be in a group shot in front of our garden and told us that she wants to come back and see some of our yields. Thank you so much Mayor Jackson! Your visit was fantastic and we really appreciate everything you and the City Councillors have done for us down at the gardens. Then it was time to get to work. We taught the kids to make some Compost Tea (well ok, it was not authentic compost tea as we only let it steep for a few minutes. 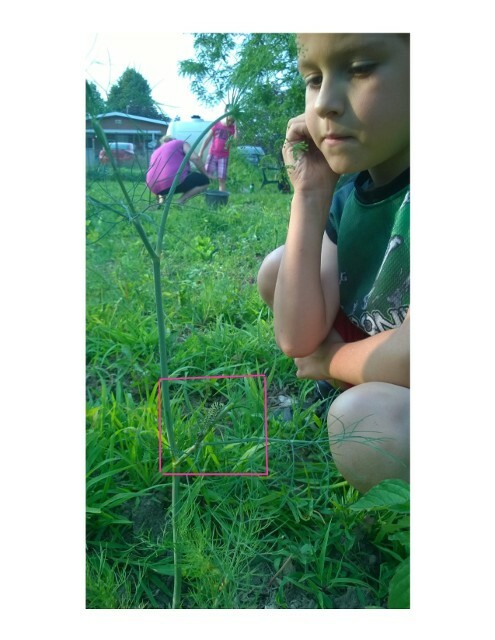 But we explained how you would make it in your home garden.) 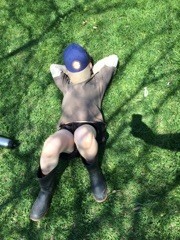 Then we hit our garden with some of our new Brew and did some weeding. Great job guys! For a review of last year's program, please scroll through the images below. 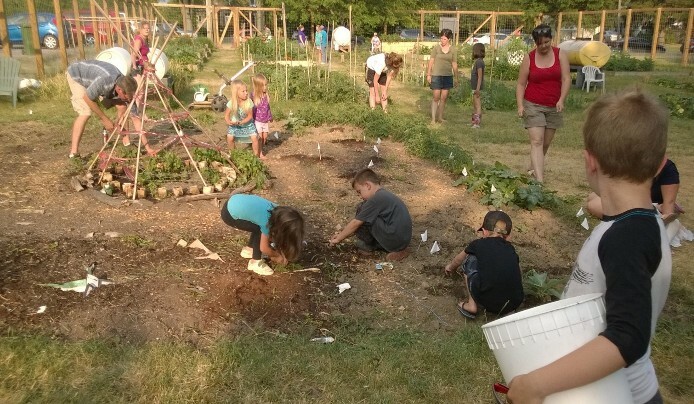 The Hope Starts Junior Gardener's Program - Earthmama Farms 2015. 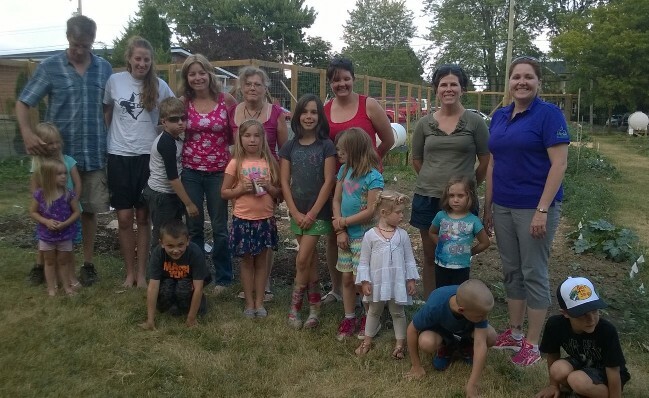 Our 2014 Hope Starts Junior Gardener's program fundraiser was a Sucess! We accomplished our goal of raising $1000 to run the program in 2015. 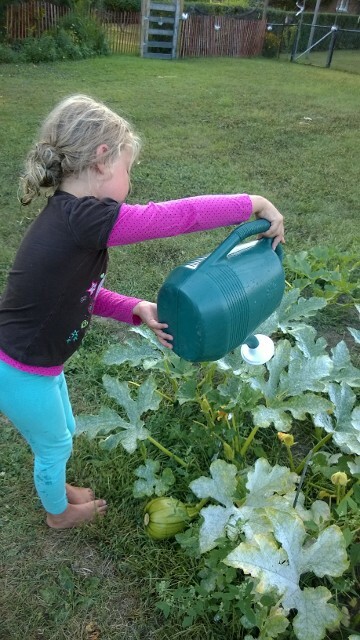 We are pleased to announce that we will be giving free sustainable gardening lessons -- And Free Vegetables!! -- to 22 St. Thomas area kids. Thank you to all who donated! 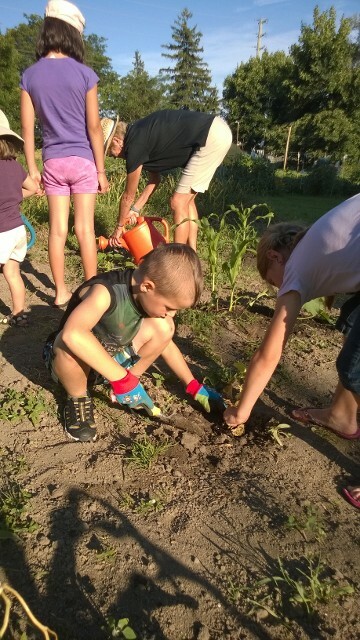 *The $25.00 St. Thomas Community Garden Rental Fee was paid by EFD for a plot for the family of one of our Junior Gardeners. It was decided at a meeting that paying for the plot would be in keeping with our mandate of promoting women’s economic security as well as local food security. 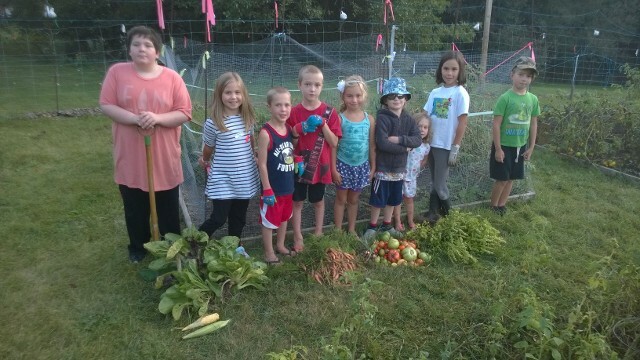 We are also very grateful to the St. Thomas Community Garden! Thanks to their generous support, we will be running the program from their First Ave plot. Sunday May 3rd........................................Opening Day / Site Prep. The opening Day was a success! We had a lot of parent help. 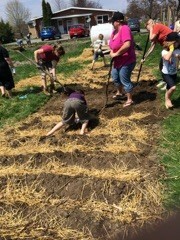 We were able to form 22 raised rows with a straw and wood chip walkway in between! It was a hot day and our workers were getting worn out. Some had to rest. And then we started our spinach, carrot, beet, and lettuce seeds. It was a great day! 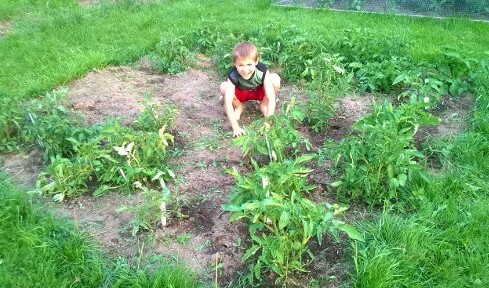 Sunday June 7th..........................Started Tomato Plot with help from Andrius Sestokas! 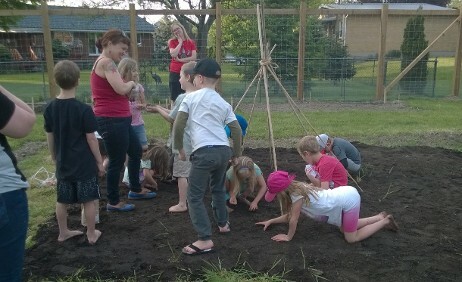 The kids also weeded their rows for the very first time, hesitantly at first but gaining confidence as they went along. 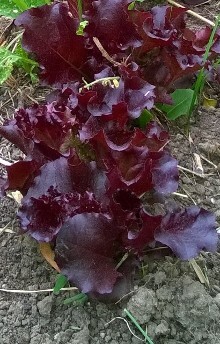 Above is some very healthy Merlot Leaf Lettuce looking bright and bursting with nutrients. 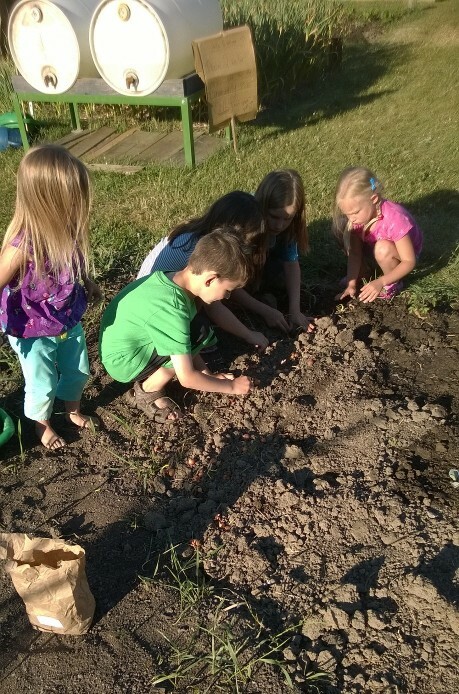 Our Junior Gardeners were able to plant their cherry tomato, basil, bell pepper, and hot pepper plants and start their green bean, yellow bean and sweet pea seeds. 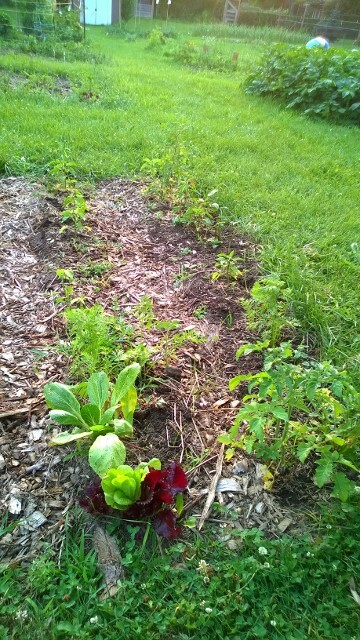 Some even added a second row of carrots, giving them their first exposure to succession planting. 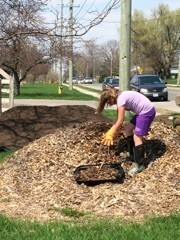 We also practised composting and learned a little bit about companion planting. Great job guys! The weather wasn't in our favour as heavy rains came through just before the class began. That didn't stop us though! Five super, awesome kids showed up anyway to work in their garden, giving their row a quick weed and in some cases, stopping to munch on some beautiful, lovely fresh lettuce leaves. Then the real work began. The large plot you can see in this photo had to be weeded, because this is where we're starting our Three Sisters Traditional planting. Ok, so we maybe didn't do as thorough a job as we would have if there had been more of us, but we did our best. The rain was coming down hard, which made the weeding easy, so that was a blessing. Then, we stood in a circle and passed around a stone bowl containing our corn seed, which had been soaking in water overnight. I asked the kids to each take a turn holding the bowl in their hands while thinking of something hopeful for our planet, and then it was time to get to work. We made our mounds, and then honouring the four directions: North, South, East, and West, we carefully placed a seed in each corner to form a diamond shape, then we pressed the seeds into our mounds. After that it was time to clean up. 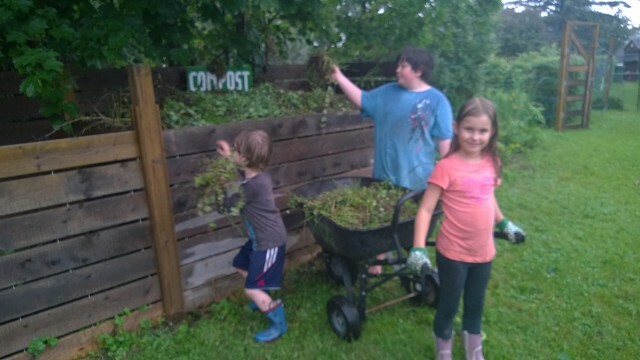 The kids, soaking wet by this point, loaded up the wheelbarrow and took all of the scraps to the compost pile. All in all, a good night! 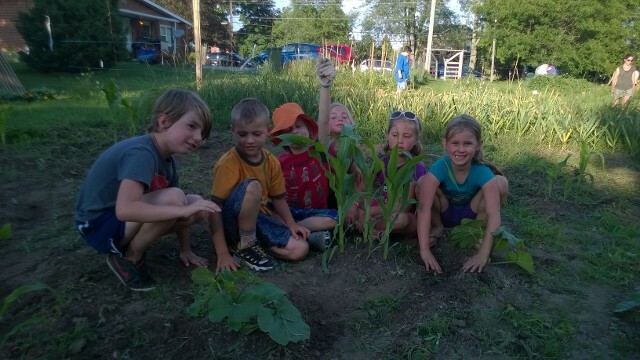 We'll be back next week to put in our squash and our bean plants to climb up the corn which will hopefully have sprouted by then thanks to all this rain! Again with the rain! 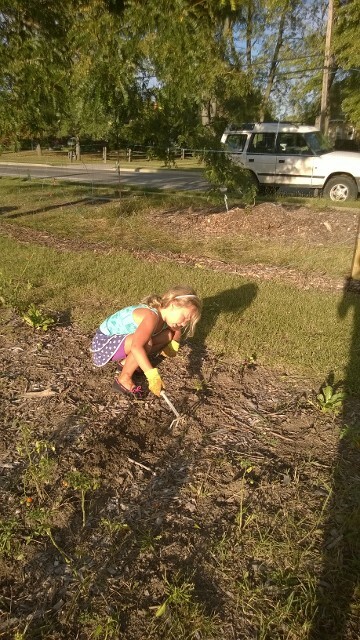 We did some preliminary weeding of our rows and then it was off to the Three Sisters plot to plant our pumpkins. The kids were very excited to see the beginnings of the corn coming up, but we decided that it was still too small to plant our beans around. We had each child take turns putting in a pumpkin seed (seeds donated by Dwarf Tree Orchards). We're hopeful that we will get enough pumpkins for each child to have one for Halloween. We had a very productive evening which began with some light yoga stretches, then we got to work. We had a lot of weeds growing in our dedicated tomato patch, but apart from some clear evidence of deer munching on the new growth, the tomatoes are looking pretty good. We also took some time to clean up the site, removing the last of the Mushroom Compost from the tarp donated by McSmith's Organic Produce and folding it back up to be returned to them. 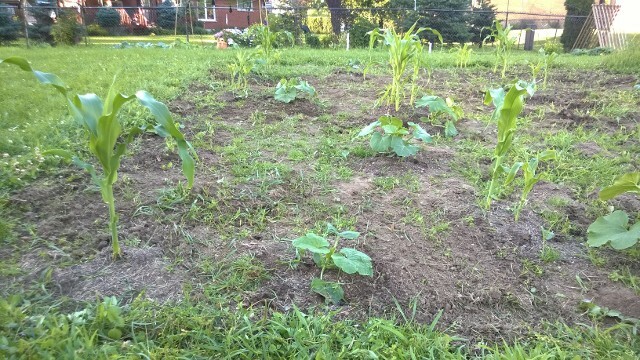 We also weeded our rows, and some of them are looking pretty good. We also found this guy, a little Caterpillar, which gave us the opportunity to have a conversation about the importance of pollinating insects. Last night's class went pretty good. 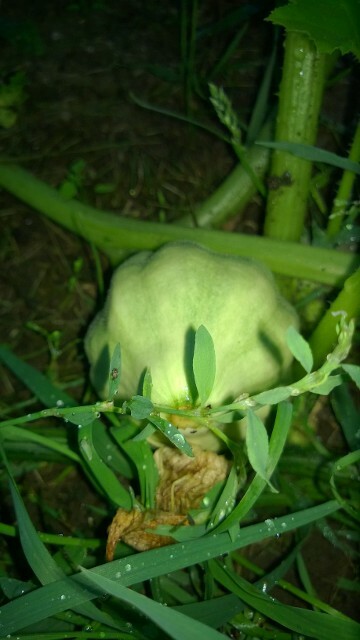 We had a big job to do, weeding in our giant Three Sisters plot, and the task proved to be too great for the time at hand, but we did our best : ) We began by weeding around our freshly sprouted pumpkin plants, which I'm sorry to say, the deer have been wreaking havoc on. You can see the new growth leaf in the photo has been eaten. Some of them were looking pretty good, though, and hopefully now that we've cleared around them that will give the plants a chance to thrive a bit better. We also cleared around our corn stalks so that we could plant our beans to climb them. This job was meant to be done a couple of weeks ago when we were rained out, but better late than never! 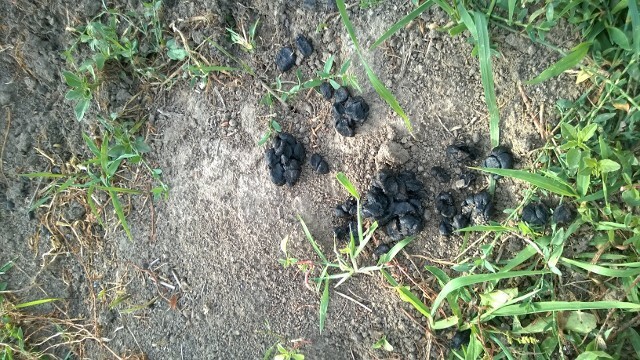 Unfortunately some of our corn is being eaten by the deer as well. All in all, we worked hard at this plot for the entire class. We got our beans put in, and even though we didn't get all of the weeds, it still looks a lot better than when we started. 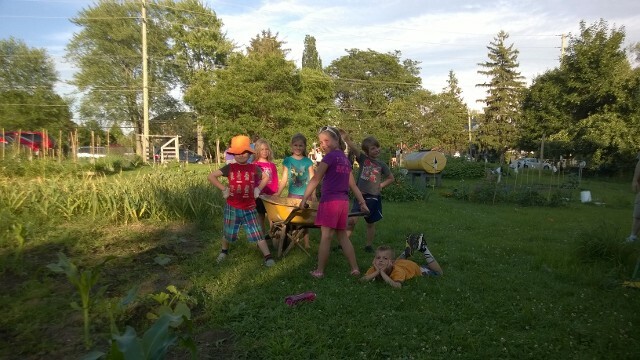 There has been some comments made to us of late that we aren't keeping our plots weeded as well as we should, and truth be told, there's some validity in that : ) But these are kids, and they're doing their best, and sometimes we lose half of our crew for a few minutes while they run off and play tag by the composter. 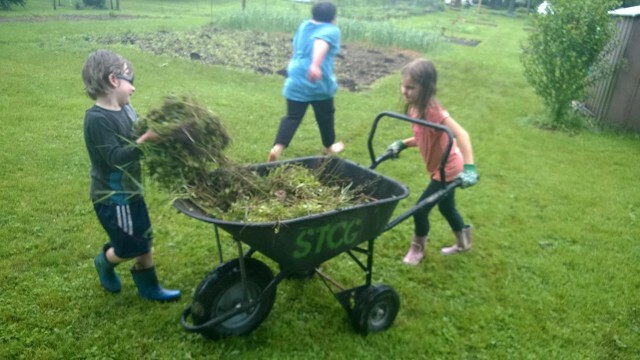 There are friendships forming amongst the Junior Gardeners, they're out getting fresh air and excercise, they're having fun and they're learning a lot about growing food, so my philosophy is, if there are a few weeds left at the end of the day, what's the harm? Until next time! The sky was plenty black last night as a series of heavy downpours rolled through Elgin County, but that didn't stop us from heading to the Hope Starts plots to check in on our tomato situation. 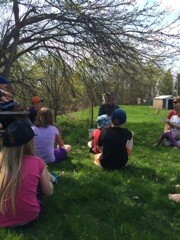 We were fortunate enough to have a visit from our Tomato Advisor, Andrius Sestokas, who gave the kids a talk on Early Tomato Blight, how to identify it and how to treat it. After that it was off to our Three Sisters plot, the largest of our plots and also the most time consuming to weed. 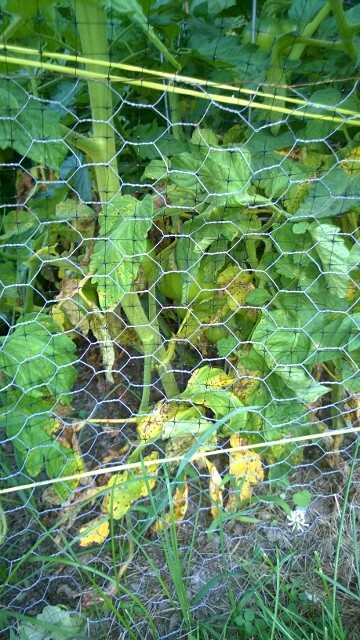 I hope the pumpkin leaves fill out soon so that they can begin the work of shading out the problem weeds and thistles! With help from Andrius and his lovely wife, Mai, we were able to get the plot in shape, or at least looking better than it was. Here is a picture of the whole thing. 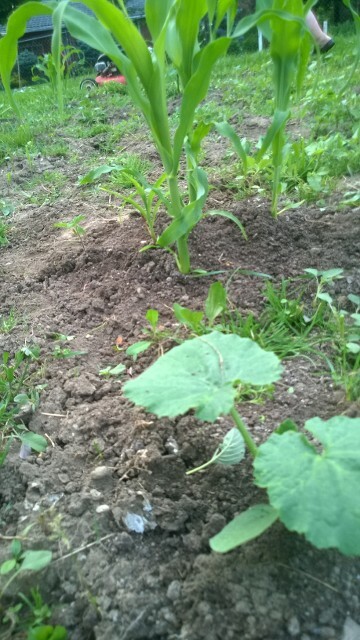 You can see that a lot of the corn is coming up really well, as are some of the pumpkins, but most of our brand new bean plants are being eaten by the deer. Ah well! Live and learn. 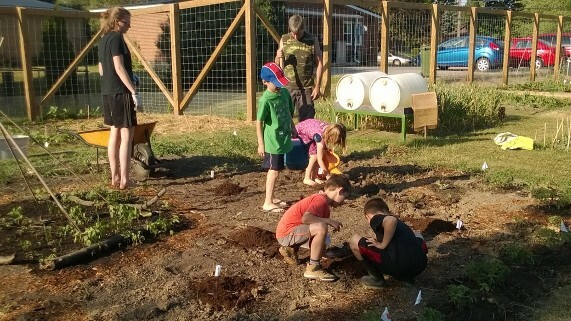 The most important thing was that the kids had fun, learned a little bit about tomato blight and how to treat it, practiced identifying weeds versus fledgling seedlings, and continued to work together as a team with clean up and compost duties. All in all, another great week with Hope Starts! 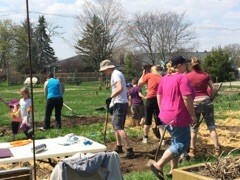 The work day at the St. Thomas Community Garden, organized by the new site coordiantors Marg and Dianne, was very well attended. We had a visit from some of the gardeners from the Kains Street location who helped us with some very important tasks such as making repairs to the deer fence. Hopefully that will help eradicate loss of our produce due to deer. 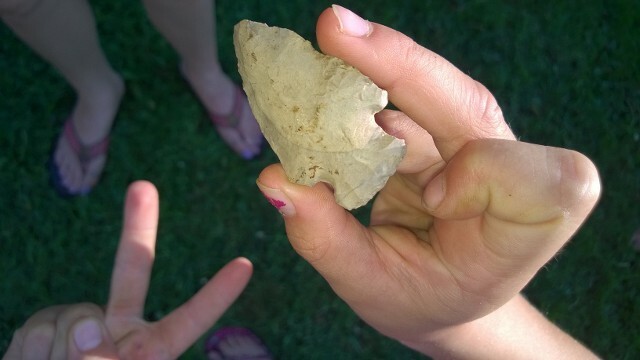 We even had the privelege of observing a historical artifact, a traditional First Nations arrowhead found in the community garden plot by one of the gardeners at the Kains plots. This gave us a chance to talk about First Nations heritage in this part of the world. We talked about the fact that a different type of culture than the one that we're currently experiencing used to live and thrive sustainably in this area. The people who lived here used tools such as this one, and being able to handle it served as a visible and tangible reinforcement that the type of agriculture we are exploring in our Three Sisters Plot was actually practiced here. Thanks Mary Ellen! 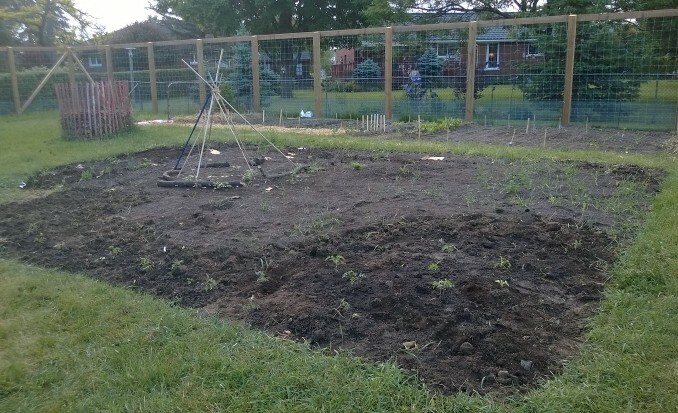 We did some work in the Three Sisters Plot, filling in some of the spaces that had been created by deer eating our pumpkin plants with some cantaloupe plants donated by Marg from the First Ave plot. Hopefully these ones will get a chance to establish themselves now that the deer fence has been repaired. Wish us luck! 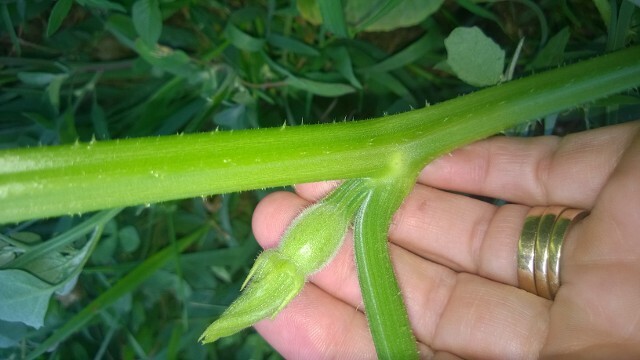 You can see where the straw-like pumpkin plant stems have been chewed off, resulting in stress to the plant. Our deer problem has resulted in the loss of some of our corn, all of our beans, all of our peas, most of our beet tops, (there may still be beets growing under the soil but if they are, there are no shoots coming up from them) and even some of our pepper and hot pepper plants! 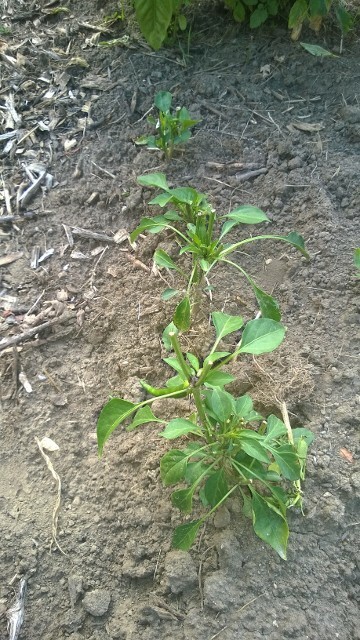 You can see how the tops of the plants are completely gnawed off. This has been a disappointing week for us, I'm not gonna lie. We had such fond hopes that the repairs to the deer fence would hold, and that we would be able to get in a second planting of beans and peas, but there's no point. The Hope Starts kids and I counted nine new deer holes that were made since last weekend. A frustrating day to be sure, but hey. That's life and that's gardening, and it gave us the opportunity to reinforce the message that just because you have a setback doesn't mean you give up. 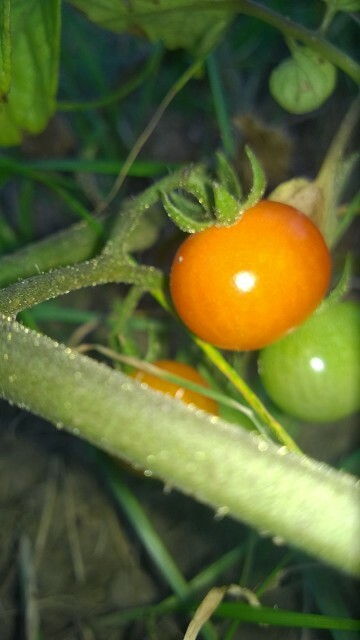 but cherry tomatoes like this one don't last long when the kids are around. 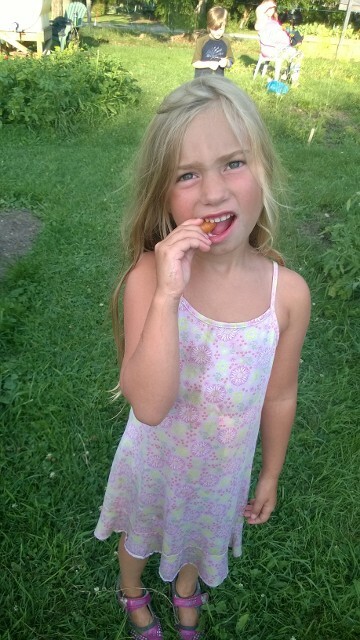 They get picked fresh and eaten during the classes most times, but what's better than a fresh ripe tomato eaten warm from the sun? Who could resist! 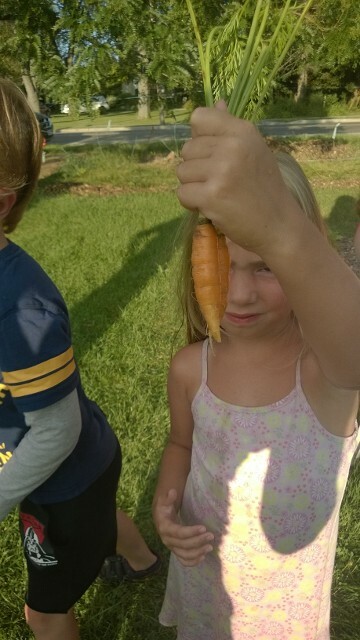 We thinned out some of our carrots and split the baby ones evenly amongst the kids that were present (not a great turnout unfortunately) and after a quick rinse, these too went down the hatch! Progress in the Three Sisters Patch! 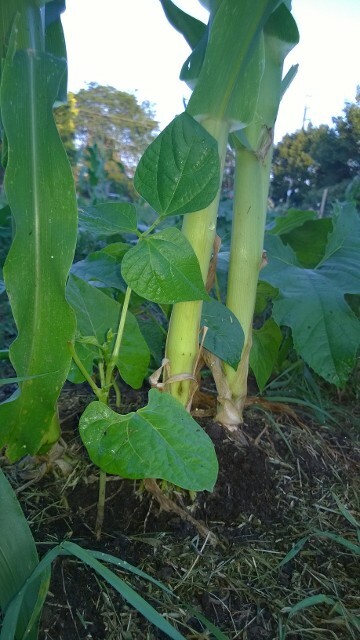 As you can see in the above photo, our pole beans are climbing our corn stalks! This is remarkably great news, as our Three Sisters patch is under triple threat from the deer with all three plant varieties seemingly amongst the deer's favorite snacks. 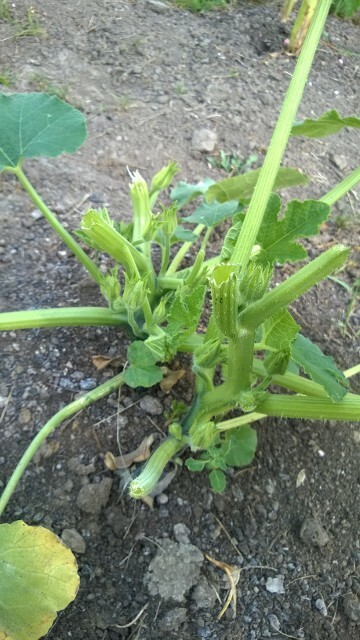 We noticed that we've got some squash coming as well, which is wonderful news. 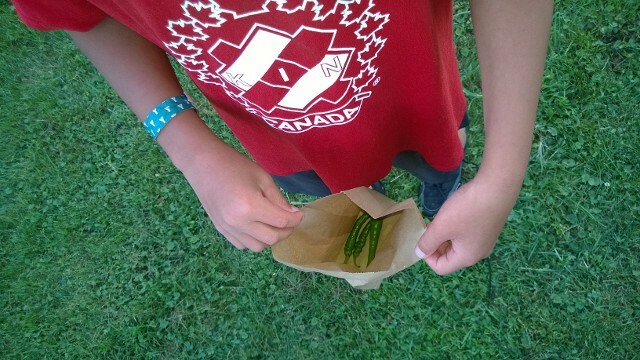 We also picked a few cayennes, which were still green, which resulted in some of the boys having a hot pepper eating competition. We decided not to have a class this week. The weather has been very dry of late, resulting in very few fresh weeds to be picked, and then yesterday we had a big rain, which meant there was nothing to be watered. We had been notified by some of the parents (Thanks Catelyn and Tara!) that their children would be unable to attend tonight's meeting anyway, so we decided to take the night off. See you next week! 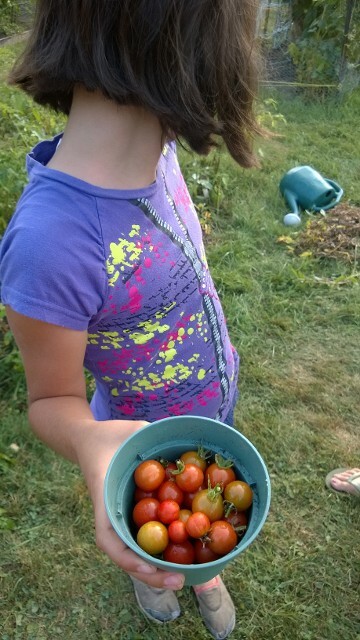 We had a pretty good harvest of cherry tomatoes today, with many being eaten onsite and some managing to be sent home with the kids for their families to enjoy. 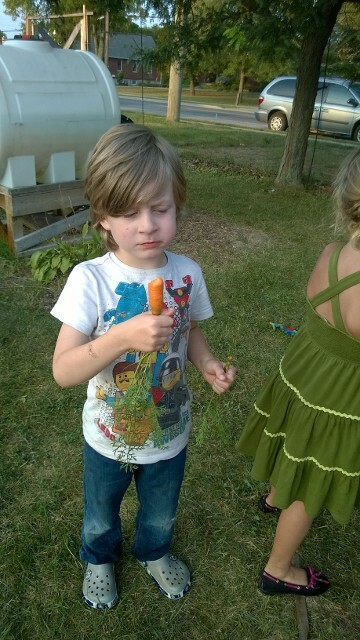 The kids are still continuing to enjoy the fresh carrots. They're able to distinguish now which ones are ok to pull. They know to rinse them off and then eat them, and to put their greens in the compost bin. It really is great to see how comfortable they are getting with the garden. They're beginning to take ownership a little bit, and know that it's ok to pull this carrot because I planted this carrot and I thinned out the other carrots so that this one could grow. Despite the losses that we've suffered from the deer, it's this that makes the program worthwhile. Arrived at the garden tonight and found - you guessed it - more deer damage. 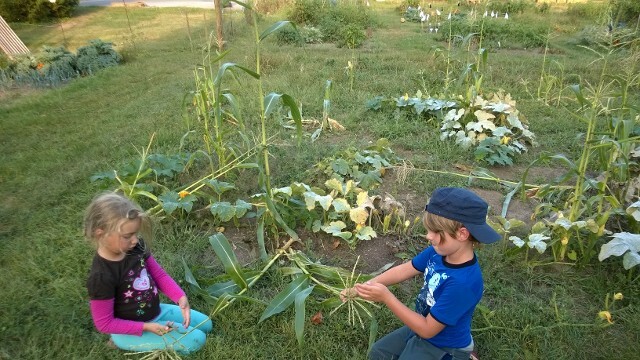 Many of our corn plants were knocked down, and we lost some of our pumpkins as well. 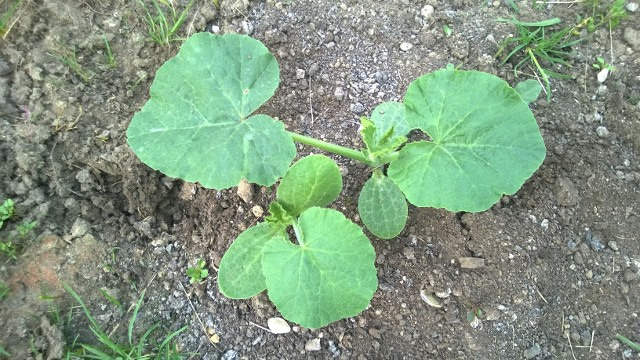 You could see where the deer had walked through the Three sisters patch, knocking the baby pumpkins off of their stems. One little pumpkin remained, however, and we gave that one some tender loving care. 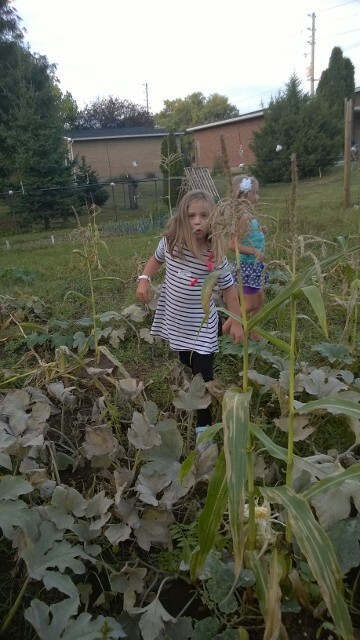 Special thanks to First Ave Community Garden site coordinator Marg also tonight, as she was kind enough to offer the kids the chance to harvest some of the beans she had planted in the community plot, to give them a chance to experience a bean harvest since ours were eaten by deer. 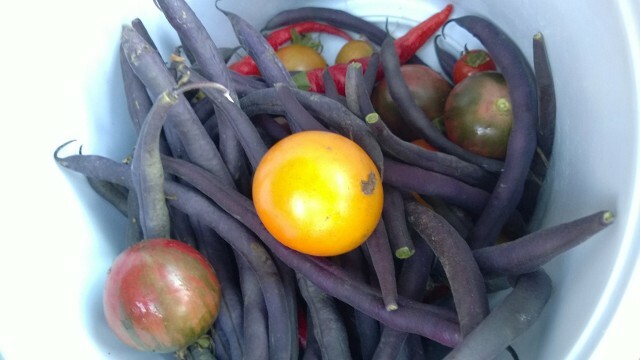 We picked quite a few beans, and some interesting tomato varieties as well. 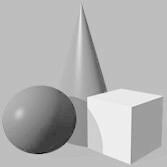 No photos tonight, as we forgot to take some, but we did have a nice class. The season is winding down, the evidence is there in our greens which have largely gone to seed (some of which we saved for next year) and the browning of our squash and pumpkin greenery. Next week will be the last of our weekly classes, and after that the season wraps up with our harvest celebration on October 25. Sunday September 20th - last weekly class of the year! 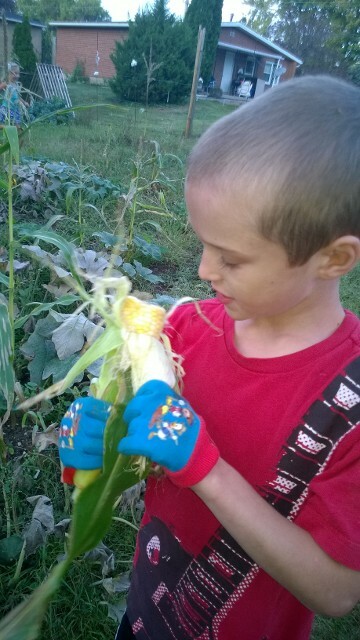 We did our main harvest tonight, picking and sorting everything that we could including our few surviving ears of corn. It was a fun evening, but also kind of bittersweet, as with the end of weekly classes the kids won't be seeing each other, or the friends that they've made through the program.